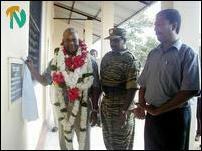 Colonel Pathuman first declared open the new building put up at the Poomarathadichchenai Siththivinayagar Vidiyalayam providing accommodation for five classrooms and an office at a cost of 1.56 million rupees Saturday morning and later on the same day evening the second new building constructed at a cost of about 2.15 million rupees at Ilankaithurai Muhathuwaram Tamil School providing accommodation in seven classrooms. Mr. Lankanesan unveiled the plaque in the Poomarathadichchenai school new building and Trincomalee district Deputy Project Director Mr. R.Umakanthan at Ilankathurai School. Later, chief guest Colonel Pathuman and other guests, including, LTTE Trincomalee district political head Mr.Thilak, NECORD Project Director Mr.Lankaneson, Deputy Project Director Mr. Umakanthan and Eachchilampathu Divisional Education Officer Mr.V.Vettivelu were taken in processions to the schools by students, parents and well-wishers with band music and Nathaswaram in attendance. 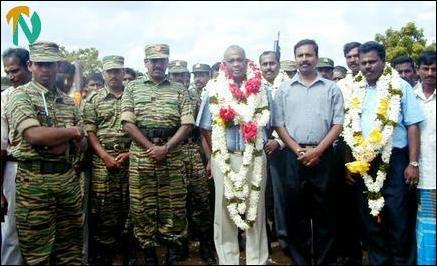 Addressing public meetings held in two schools later, Colonel Pathuman said, "the success of current peace talks to find a political solution to the Tamil national question solely depends on the strengthening of our military strength. That does not means we are for war." "The current peace situation would prevail until we retain our military strength. We would be taken for a ride once we started losing our arm power. 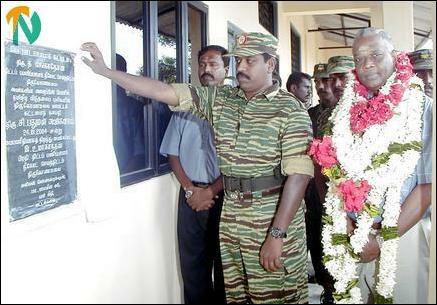 Hence Tamils should come forward to strengthen the LTTE militarily to achieve success in peace process," said Colonel Pathuman.
" Tamils live in a situation for the last two years where no peace or war prevails. The current government is not prepared to provide any urgent relief to our people. The government for the last two years has not initiated any concrete development and rehabilitations projects for the benefit of our people who have been badly affected by the war. However, the governments in power frequently work out strategies to weaken the military strength of our liberation struggle," stressed Colonel Pathuman. Colonel Pathuman further said," we cannot sit and wait thinking that a political solution would be arrived at shortly. For two years the government in power has not taken any steps to restore normalcy in the lives of war-affected Tamil people. How can we expect a political solution from them in the coming months? The political parties in the south which accuse the LTTE of preparing for war are now fighting among themselves to capture power." NECORD Project Director Mr.Lankaneson said the NECORD would undertake several development projects in the underdeveloped Eachchilampathu division in Muttur east before the end of the year to ensure that all schools would be provided with chairs and tables to students. At present in most of the schools in the division, students learn while sitting on the ground, as they have not been provided with necessary furniture.
" NECORD has been given two years to implement urgent developments in war-affected villages in the provinces. If another two-year period is given NECORD will implement development projects such as construction of hospitals, main roads and small roads that could boost the health and rural economy of the war ravaged villages," said Mr.Lankaneson. NECORD has dedicated itself to rehabilitate the most affected Eachchilampathu division and to restore basic infrastructure, he said. "We have been working twelve hours a day to plan out and implement rehabilitation and reconstruction projects to rebuild the northeast. It is our duty. We would be doing immense and irreparable harm to our people if we failed in our duty to rebuild our war-ravaged land with the available resources," said Mr.Lankaneson. Mr.Lankaneson assured that NECORD would provide a two-storied building to Ilankathurai Muhathuwaram School in the coming months. He said the school authorities could convert the building into a hostel to provide accommodation to Year 5 students of Eachchilampathu division to study for scholarship examination. He said parents of rural areas should give more attention to the education of their children. Rural students would become slaves if the parents failed to provide better education to their children at proper time, Mr.Lankaneson said. LTTE Trincomalee district political head Mr.S.Thilak paid a glowing tribute to NECORD and its Project Director Mr.Lankaneson, saying that the presence of NECORD could be seen wherever people have been suffering without basic infrastructure facilities in the war-torn province. Colonel Pathuman declares open the building. Mr.Thilak (extreme left) and Mr.Lankaneson ( extreme right) are also seen at Poomarathadichchenai school building opening event. Mr.Thilak further said, " NECORD gives priority to development projects correctly identifying the urgent needs of the war affected people and areas in the province". NECORD District Project Director, Mr. R.Umakanthan, and LTTE Trincomalee district head of the Education Unit and Women Political Division, Ms.Kaaronja, also spoke. The public meeting at Poomarathadichchenai Sithivinayagar Vidiyalayam was presided by its principal Mr.T.Satheeswaran and at Ilankaithurai Muhathuwaram School by Principal Mr.K. Thayaparan. Ilankathurai Muhathuwaram had been badly affected by the conflict from time to time since 1985. The village infrastructure was badly damaged. In 1990 about 75 percent of more than four hundred families in the village were displaced and the resettlement commenced in 1993. Most of the villagers depended on fishing. About eighty five percent of families are Samurdhi (poverty alleviation) beneficiaries. Currently about 618 children of resettled villagers are studying in the Ilankathurai Muhathuwaram Government Tamil Mixed School, which is in the Liberation Tigers held area. ( L-R ) Chief guest Colonel Pathuman ( 3rd from Left), NECORD Project Director Mr.Lankaneson, NECORD Planning Expert Mr.V.Mahendrarajah, LTTE district political head Mr.Thilak and NECORD Trincomalee District deputy Project Director Mr.R.Umakanthan area are taken to the venue. Of the 618 students about 338 do not have proper accommodation. The existing building has only nine classrooms. Other seven classes are conducted in a temporary shed, sources said. A new building has been constructed in the Poomarathadichchenai Sithivinayagar Vidiyalayam, which will provide accommodation for 5 classrooms and an office at a cost of 1.65 million rupees. In the disturbances in 1990, about 85 percent of the families were displaced from this village. The resettlement commenced only in 1996 and 96 percent of the villagers are Samurdhi (poverty alleviation) beneficiaries. Most of the villagers depended on agriculture for the livelihood. The sole building of the Sithivinayagar Vidiyalayam was completely destroyed. Since 1996, the school has been functioning with 112 students in a temporary shed without a permanent building, sources said.